The operas of Monteverdi were a new discovery for me, I knew of them but as I am more a fan of the late romantic operas of Strauss, Verdi and Wagner and also of the classical era operas of Mozart, I admit there was a stretch where I wasn't interested. 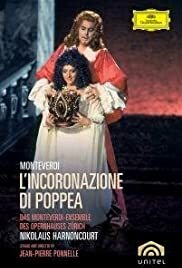 How wrong I was, as after hearing L'Incoronazione Di Poppea and L'Orfeo for the first time a year ago there is much to like about Monteverdi's style especially with its melancholic purity. The stories of both operas are also very compelling and moving, with the narrative of L'Incoronazione Di Poppea very complex and thoughtful. This production, directed by Jean-Pierre Ponnelle, is highly recommended, as well as Ponnelle's L'Orfeo. The costume and set design are typical Ponnelle, very simple and elegant yet are very baroque/renaissance without being too old-fashioned. Some of the actions and emotions in the staging are somewhat contemporary, but I didn't find this jarring, in fact quite interesting. Musically, L'Incoronazione Di Poppea is wonderful. With a stylish orchestra and Nikolaus Harnencourt's very involved conducting, the production is a musical feast. The sound, re-mastered, does the music and the performances of it justice, and the camera work and picture quality look great. I loved the principal performances. Eric Tappy mayn't quite be my initial idea of Nero, the role is usually that of a soprano rather than a tenor, however while occasionally a little stolid, Tappy does sing beautifully. Of the production my favourites were Rachel Yakkar's Poppea and Trudelise Schmidt's heartbreaking Ottavia. I mustn't forget Matti Salminen, who is always great vocally and dramatically especially as Hagen and King Marke, and here is no exception.